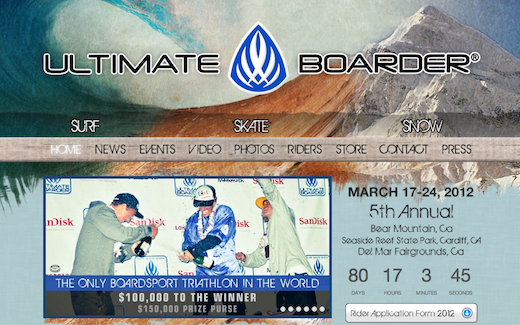 We are super stoked to be working with Ultimate Boarder! For those of you who are unfamiliar, the Ultimate Boarder Competition is the only board-sport triathlon in the world which finds the best all-around boarder in the Surf, Skate, and Snow realms. 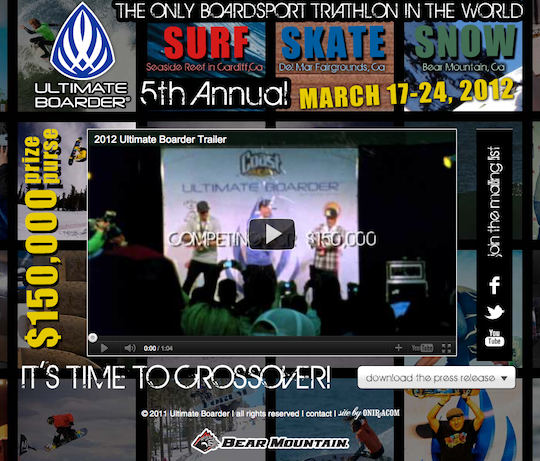 We are in the process of building out and designing a sick website that will be the platform for this 5th Annual event, but for now we put together a cool splash page featuring the trailer to the 2012 competition - check out the beginning at UltimateBoarder.com! The official trailer for the 5th Annual Ultimate Boarder Championship, taking place March 17-24, 2012. Ultimate Boarder is the only board sport triathlon in the world and has one mission: to find the best crossover athlete in surfing, skateboarding, and snowboarding!